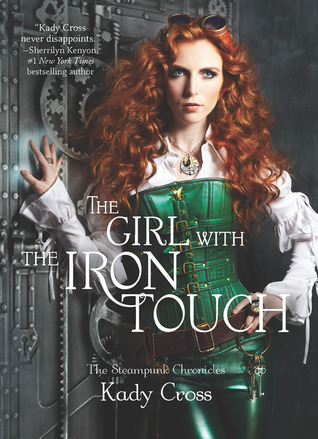 I have to say that this book series is possibly one of my favorite depictions of Victorian steampunk out there. Additionally, this series was the first to introduce me to the amazingness that was Steampunk. Now, I'm definitely not going to try to describe what steampunk is because it takes forever and is considerably complicated since authors can go in so many directions for it. Sadly, this series experienced a case of 'second book syndrome'. It's not to say that it wasn't good, but it didn't reach up to the expectations of The Girl in the Steel Corset. Fortunately, The Girl with the Iron Touch did not fall flat! Would I say I am a faithful follower and lover of this series? Yes times a million! I love pretty much everything about it! There's these evil and barely hard-to-destroy automatons, these velocycles (which are like motorcycles but cooler and more Victorian), little organites or 'beasties', superpowers, and cravats. If that doesn't spell for a story of awesomeness, I don't know what will. Finley Jayne, I think, will always be a favorite character of mine. I loved the conflicting and polar opposite sides that she had to her in the first book, for it even created a type of mystery and danger to her. Even though she's not all Jekyll and Hyde anymore, I still find her to be a very captivating and interesting character. She never does want the assistance of a guy to help her, because she is fully capable of handling things on her own. However, she doesn't automatically cross the line into martyrdom and actually knows when to accept help. She, while having a very violent side and a very sweet side on occasion, is a well-balanced character. And can I just say that I have been in love with Griffin ever since the first book? Because I do. As it so happens, I don't think that my love of him will ever die. I'm not sure what it is exactly about him that makes me love him so much, but maybe it has to do with the fact that he will do anything to save and protect his friends. He's got this whole tortured aspect to him, but I let that slide because unrequited love never quits. On top of that, it has been proven that he is in need of saving more than anyone else in this series, and possibly that vulnerability about him and that honesty makes him a real and lovable character. Action! Plot! Mystery! This book has it all. Things were unraveling, new characters were introduced (or reintroduced), blood was spilled, relationships were created. In all, it was a fun time for all the characters (and reader). There really weren't any dull moments. The plot was fast-paced and all these things happened and it was all so awesome! Alas, the writing wasn't all too amazeballs. As in, there wasn't any lengthy, descriptive paragraphs on the streets of Whitechapel or things of the like. That was fine, but it's just one of those things, ya know? Like, it's almost superficial writing. If you haven't read this series yet, I don't know what you could possibly be doing with your life. Read the magnificence of Steampunk, read about the motley crew of misfit super power awesome people, and read about their epic story! Read it all! Wow it sounds like this series really brings in great characterization! It's what I love to see! I've been picky about Steampunks they're often a hit or miss for me but this series has been getting a lot of rave I should check it out! Great review, Millie! This series was also my first foray into steampunk! I still need to pick up the last book in this series, but I'm glad you enjoyed this one so much. I love Finley and Griffin to pieces as well, to be honest. They're both such fantastic characters. The fact that this book really does have it all excites me so much!! I can't wait to pick it up.